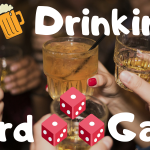 Everyone loves a little healthy competition and most board games out there offer a healthy dose of the good stuff. Sometimes there’s nothing better than pulling off a strategic combo that leaves other players in the dust, giving the winner endless opportunities for bragging rights and rematches. But sometimes competition can be a bit stressful. Sometimes there will be a player in the group that hates competition. The best way to calm the crowd is with a fun (and collaborative) cooperative game. Cooperative board games are a type of board game in which the players work together to solve a problem, using teamwork and strategy to overcome the board itself. We have some friends who really don’t like board games. (Yes, I hate to break it to you, but people like that do exist.) Cooperative board games, however, have been the perfect olive branch to bring those weirdos into the fold. I consider it a point of pride to have gotten my anti-board game group really engrossed in a cooperative game to the point where they might actually try a competitive game one day. Perhaps they are the ultimate gateway game. There are tons more out there, but here are some of our favorite cooperative board games. If you’re new to the genre, this is a great place to start. You and your team are the last defense standing in the way of deadly diseases that threaten the world! Flash Point: Fire Rescue is a fully cooperative game, everyone plays on the same firefighting team – win or lose together. Every turn is filled with the tension of having to fight the fire back rescuing victims or investigating points of interest. Players explore a haunted mansion, encountering spirits and frightening omens that foretell their fate. Secretly, one of the characters betrays the rest of the party, and the innocent members must defeat the traitor in their midst before it’s too late! Players start in a small, weakened colony of survivors in a world where most of humanity is either dead or diseased, flesh-craving monsters. Each player leads a faction of survivors with dozens of different characters in the game. During each game, the heroes embark on quests and venture into dangerous caves, ancient ruins, dark dungeons, and cursed forests to battle monsters, earn riches and attempt to stop the overlord from carrying out his vile plot. Arkham Horror is a cooperative adventure game themed around H.P Lovecraft’s Cthulhu Mythos. Players take on the role of Investigators who must prevent the Ancient One from breaking into our world. In Forbidden Desert, your steampunk airship has crash-landed in the desert and you all need to work together to retrieve all the pieces before everything is buried under the sand and you are trapped forever! You and your team will travel back (or forward) in time to prevent some cataclysmic event. But don’t waste a moment. Every second counts! In T.I.M.E. Stories, you will work cooperatively with a team to solve a mystery taking place in a different era. Did you ever watch the movie Outbreak (you should) where there’s a super virus that begins to wipe out the entire population of Earth and nobody can stop it except for Morgan Freeman? Well, you too can be Morgan Freeman in Pandemic! Or more accurately, you and your friends can band together to stop the violent diseases rampaging throughout the world. Pandemic is an absolute modern classic. Everyone takes on a specialized role and works together to combat the outbreaks of diseases, and if you don’t work together you will lose. The game is very difficult, and you will need to utilize all of your abilities and actively work together in order to win. If any player starts to wander off and do their own thing then the world easily becomes a diseased wasteland. Every turn more and more cities will become infected, and if the infection gets worse it begins to spread to neighboring cities. The infection level is indicated by color-coded cubes placed on the cities, and throughout the game, a pandemic will occur in which a random city immediately goes up to full infection, and the infection deck is reshuffled and reset. This means that you are always in danger of your cities being overrun with disease. There are several ways to lose the game and only one way to win so you need to make sure all your players are on the same page. The specialist powers your players will have are all extremely different and each is useful. Some definitely are more powerful than others but they all are useful. As a cooperative game, I don’t think you can really beat Pandemic. It pits you against a faceless, implacable enemy that never stops. I’ve played a lot of games and every win was by a thread. It is so tense and nerve-wracking drawing cards at the end of the turn because you never know when an Epidemic card will show up and destroy all of your carefully laid plans. That tension really binds the group together and doesn’t just force you to work together, but really makes you want to support the other players. There really isn’t anything like a photo finish win at the end of a Pandemic game. If you’re new to Pandemic, check out our in-depth review of the original game before you get started! If you’re bored of the original and too scared to tear up cards (in Legacy) there are plenty of other variations out there! 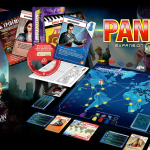 A bunch of other Pandemic games use a similar system with different themes, including Pandemic: Iberia, Pandemic: Rising Tide, Pandemic: Reign of Cthulhu, and Pandemic: The Cure (dice version of Pandemic). • Random setup and characters make for a unique experience every time! Most Dungeons & Dragons players have the same complaints. It’s too hard to get everyone together! Who’s bringing the beer? When are we going to order pizza? And… Who is going to be the next Dungeon Master? Gloomhaven is a dungeon-crawl board game that puts each player in the shoes of a classic adventuring hero and shoves them out into the world to fight monsters and bandits. The most interesting aspect to me is that the characters all level up too! The longer you play the main campaign of the game the stronger your characters will become. You can receive loot for completing missions and gain abilities as you level up. It has all the classic elements of a role-playing game and it is so much easier to get everyone to sit down and play. Gloomhaven comes with a central campaign that will keep you busy for many gaming sessions. And if that wasn’t enough, they built in a rather ingenious randomizer by using two decks of cards. One deck will show you what enemies, traps, and treasures you will encounter in a room. The second deck will show you which room tile to use and where to place everything. It’s a simple way to keep things fresh and works so well. The game comes with a pretty hefty price tag, but once you look at what’s under the box you can clearly see that it’s worth it. For example, four players going through the main campaign takes approximately 150 hours to complete. That doesn’t include any random games, while drastically underestimating how long a game will take. 150 hours total multiplied by the number of players. Skip the first step if you want to see what the general 4 player game hour costs. $140 / 150 = $0.93 per game. I really don’t know of better cost to entertainment value ratio, but again, this is how I justify my massive board game collection. In Flash Point, every player will take the role of a firefighter responding to a house fire. It is your job to save everyone inside before the house burns down to the ground or loses structural integrity and collapses. In your first game, you’ll play as a generic firefighter to learn the rules, but there are additional rules and specialist cards that give each player a specific role they can play, like fire caption, hazmat specialist, medic, or even the generalist. Each one is much better at certain actions in the game. The hazmat specialist can remove hazmat instantly from the game, the medic can heal wounded survivors which allows them to move out of the building faster, and the fire captain can move other players on his turn, setting up your teammates for better positioning. This is one of the games on this list that is purely cooperative. There is no incentive to work against other players, and every reason to unite against the board. If players do their own thing without talking and planning you may find yourself with too many lost victims or damage to the house, leading to a loss for the whole party. Kendra and I are both former firefighters, so this game has a bit of nostalgia attached to it for both of us. We both have played this quite a few times and think it’s a fantastic game. The fires spread randomly by dice rolls at the end of every turn and can get quite tense as fires start to get near our favorite survivors (the kitty and puppy). The one negative thing I can say about this game is that we’ve gotten to the point where we all have our favorite specialists, and it always seems like we have to have the Deck Gun specialist that controls the firehose to win. It’s a really overpowered ability in my opinion. We get over that by playing games where we randomly pick a specialist and keep them for the remainder of the game. If you’ve read our Halloween article, then you already know how much we like Betrayal. We also have a full review here, if you want to dive in. In it, players will assume the role of one of the Scooby-Doo-esque characters that decide to go into a creepy house on the hill. The players will then wander the house and search through rooms to find weapons or increase their skill points in preparation for the haunt, where one player may then become a traitor and start to attack other players. So having a traitor in the game doesn’t necessarily sound like a cooperative game, but the rest of the players will still be on the same team, and players tend to be much more willing to help each other once the haunt is revealed. Usually in the opening stages of the game when anyone could become the traitor players will keep all their items and abilities for themselves, waiting until they’re sure of alliances before helping someone else. For a game that is marketed as “betrayal,” there is a surprising amount of cooperative play. If you’re looking for a strictly cooperative play with no aggressive actions towards other players, then you’re going to have a bad time. Betrayal is one of my favorites, but depending on the scenario you get, it may seem a bit one-sided. You’re going to start the game with a shared story that all the players will be laughing and talking about for a long time. After the haunt roll is failed, all bets are off. One person (or several) will be revealed at the traitors and the cooperative elements in the game are altered. There are tons of scenarios that you’ll encounter in Betrayal. Some will pit one player against the rest, some will divide the group in half, and some will have the group fighting for survival against the board. So, if you’re looking for a truly cooperative game, you may want to keep looking. “Betrayal” is the name of the game and it’s inevitable that once the haunt roll is failed, you’ll be facing off with one or more of the other players in the game. Dead of Winter: A Crossroads Game drops you into a world that’s just experienced the zombie apocalypse. The party is already in full swing and there’s not a whole lot you can do about it. Your goal is to survive by any means possible. The last holdout of survivors is holed up in a small town and you and your friends need to keep everyone alive as long as possible. You’ll also have to brave the town in subzero temperatures to find supplies. Dead of Winter is a cooperative game that is dabbling in hidden traitor mechanics. In addition to working together with other players to survive, the game adds the possibility that one of your party could turn traitor at any time. Their goal would change from saving the group to sacrificing everyone else to make sure that they are the lone survivor. And if that doesn’t make you paranoid enough, there’s also a possibility that there isn’t a traitor and everyone actually is on the same team. As cooperative games go, Dead of Winter can be rather aggressive. You’re not going to find your survivors holding hands singing “Kumbaya”. They’re more likely going to be screaming for help as their limbs freeze or as the zombie bite they got while trying to find food slowly becomes necrotized. Still, since it is cooperative, you should probably help them… unless you’re the traitor. I absolutely love zombies. Ever since my brother and I watched Night of the Living Dead, I’ve been hooked. Luckily for me, zombies have become insanely popular, especially in board games. There’s a zombie board game for almost any scenario and theme you could possibly think of. Looking for more on this game? Check our full review of Dead of Winter! • Survive the Winter, the Dead, and Each Other. • A story-centric game about surviving through a harsh winter in an apocalyptic world. It seems like we’re hitting the fantasy and dungeon crawl themes pretty hard in this article, but there’s a reason for it. Fantasy revolves around gathering a party of adventurers and facing down a monstrous threat. Bilbo and the Dwarves, Frodo and the Fellowship…. Well maybe it’s just a Tolkien thing, but the point remains the same. Building up a group of adventurers to tackle a quest is a very cooperative experience. You’ll assemble your party from a host of typical adventuring types; Dwarves, Elves, boring humans, sneaky guys, stabby gals, glowing cephalopods, you get the idea. To top it all off you get to upgrade your characters from game to game and increase their abilities by clearing dungeons (I love leveling mechanics). The board setup is pretty fantastic. It’s like looking at the blueprint of a dungeon, and it’s full of hidden doors, traps, and monsters. All of the models and pieces look absolutely amazing, and you’ll get a whole slew of options. There’s even a massive dragon miniature that’s pushing the definition of “miniature” a little bit. There is a catch, however, if you’re looking for a purely cooperative game… you might be disappointed. There always needs to be a bad guy, otherwise, it’s not really much of a challenge. One player has to take on the role of Big Bad Evil Guy (it’s a real term) and take charge of the dungeon and all of its monsters. Their job is to stop the adventurers from stealing all the loot and, ya know, to kill them. Kill them dead. The second edition of Descent is the one you’re most likely going to find. You’ll only find the first edition at a secondhand or specialty seller at this point, and that’s a good thing (in my opinion). The first addition was an incredibly in-depth game that was massive in scope, but with complexity comes confusion. The rules and mechanics took everything into account and it could be really tough to get through. Luckily, they streamlined a lot of the rules and mechanics with the second edition and games can actually be finished within an hour or two. Descent just reminds me of a first edition Dungeons & Dragons game. It’s a classic dungeon-crawl done right and really reminds me of playing Dungeons & Dragons. Usually, the Dungeon Master is always trying to kill off the players anyway, so having a player take on the role of an evil overlord to try and kill everyone just feels like nostalgia to me. In Arkham Horror players take on the role of a classic investigator looking into the strange disturbances going on in the town of Arkham. It’s a constant battle against portals opening up and spewing horrific eldritch monsters into town. On top of it all is the Elder god, threatening to awaken after eons of slumber which, if left unchecked will bring destruction to all of humanity. It’s a pretty high stakes game. Therefore all players will be working together against the board. Each player has a special ability that makes them more useful at certain tasks. And believe me, you will need to play to your strengths and work together to ensure victory. Arkham Horror is a highly cooperative game where I’ve found myself planning and strategizing with other players. Very often, this involves trading weapons and giving assistance to others in the game. There is a hidden victory point system in the game (that is only briefly mentioned at the end of the rulebook) stating the player with the most points is the “First Citizen of Arkham,” but most players won’t even notice or pay attention to it. The core of the game is cooperative and it really does feel as if everyone has the group’s best interest in mind when playing. There is no backstabbing and if players don’t work together it can be very difficult to win. That being said, I don’t think I’ve ever lost a game of Arkham Horror when playing just the base game. When you start to add expansions however the difficulty (and fun) goes up exponentially. The first expansion I played was Dunwich Horror, which adds so much more depth to the game. As a standalone game, Arkham Horror is fantastic. It truly deserves its place among best horror games and certainly cooperative games as well. The cards, artwork, and gameplay are all very appealing, and the theme ties everyone together with the common goal. There are several Elder Ones (boss monsters) and investigators (player characters) so that you can’t really see everything in one playthrough. The only real downside that I have with this game is that because it’s so huge in scope, the setup requires an extremely large playing area, and it takes a while to have everything set up to play. Personally, we justify it because after we set up the game in the morning we’re usually sitting around it playing back-to-back games until late in the evening. There are a ton of expansions for Arkham Horror and a whole world to explore in the Lovecraftian mythos. If you love the original, the expansions will fascinate and challenge your group for years to come. There is some contention about Eldritch Horror vs. Arkham Horror. but both are excellent games that excel in their own areas. Eldritch Horror is very similar in play style to Arkham. In both, you’ll be facing off an Elder god or Ancient One, closing portals, and killing monsters. Eldritch Horror changes the scope of the game, however, and the board takes that into account. In Eldritch Horror, you’ll be traveling all around the world on a global map trying to stop the Elder gods all over the world, instead of in just one town. Both are H.P. Lovecraft-inspired and draw heavily on his writings for background and story. Either one will scratch any occult itch you might have. The cooperative elements are much the same as in Arkham Horror. Your group of investigators has to save the world before the monsters take over and devour the world. They are both very similar but play slightly differently. Arkham Horror does better at roleplaying and shared storytelling. Eldritch Horror is better at being a board game. That may seem ambiguous but the differences are there. The Arkham Horror instruction manual is huge, and as you add expansions, it only gets bigger. It’s much easier to play if you have a player who already knows the rules, and after a few games, it’s pretty intuitive. Eldritch Horror, on the other hand, is much easier to play and feels like a more technically-sound board game, which may make it easier to get casual players around the table. It all comes down to personal preference, and personally, mine is Arkham, but that’s not to say either one is better than the other, they’re just slightly different. We talk a lot about Lovecraft games because we love them. Check out our full review of Eldritch Horror here. Like its cousin, Arkham Horror, Eldritch Horror has a multitude of expansions that keep the game fresh and exciting, with new monsters, new challenges, and new characters to play. Mechs vs. Minions is extremely unique in that it was designed and published by a video game company. 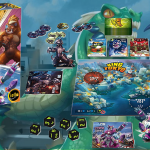 Riot Games, the creator of League of Legends decided to dabble in board games, and it made quite the match. The game went above and beyond with production value. This massive box is jammed full of miniatures, and not the flimsy mass-produced G.I. Joe kind either. Each hero minion has been pre-painted and all of the minions have a slight coloring to them so they’re not simply the generic plastic molding. On top of all of that the box itself is over the top and comes with several trays full of miniatures, each with its own individual spot. If you cringed at box organization in games like Arkham Horror then you will absolutely fall in love with what’s inside Mechs vs. Minions. In Mechs vs. Minions, you and your buddies will take control of your very own mech of doom. Each scenario will have some randomized objective: area control, defuse or transport a bomb, or simply slaughter everything in your path. You remember that box full of miniatures that I just was gushing about? Well, you’re going to be using them. There are 100 minion miniatures in the box and there are only 4 hero miniatures. I don’t think I need to do the math on this one. The minions are plentiful but that’s all they really have going for them. They are easy for you to hit and easy for you to kill, but there’s going to be a lot coming your way. Players will work together to accomplish their goals using an ingenious movement and attacking system. Each robot has a control board and players will have their own deck of cards. Each card will have some action on it (attack, movement, healing, etc.) and the players will arrange the cards on their board. As the turns go, you can perform the action at the end of the board. It’s very similar to computer logic and Mechs vs. Minions is basically using programming as the mechanic in which you move an attack. Pretty thematic for robots if you ask me. The game is highly-cooperative and promotes players working together. Because each player’s actions are going to be pre-programmed, it takes a lot of planning by the players to make sure they don’t knock other players out of position or walk into the line of fire. They did make it so that you can’t actively hurt other players with a bad shot, but you really can mess up positions and have someone attacking an empty square because you shoved them out of the way. I simply cannot emphasize how great the production value of this game is. You get over 100 miniatures and a fantastic game for a very reasonable price. The game is silly looking but is packed with strategy, and it’ll definitely be a favorite for your cooperative game nights. In Forbidden Island, you will take the role of an adventurer plundering a… Forbidden Island! Who would have thought? Your party will attempt to excavate the four treasures of the island and escape on your helicopter before the island sinks under the water and is lost forever. To me, Forbidden Island and Forbidden Desert are pretty interchangeable (gameplay-wise). There will be a ton of people who disagree with me, but I stand firm on that. The themes are different and the way the mechanics work are slightly different, but the overall gameplay is basically the same. The group must race against the clock, which is constantly creeping up on you. In Forbidden Desert, water is scarce, the sun will constantly dehydrate and try to kill your players, and the playing field is always shrinking in both games. The island will constantly flood and if you’re not careful, you’re going to lose whole sections of your board quickly. Forbidden Desert uses an ever-swirling storm that constantly threatens to bury the board in sand, decreasing your chances of finding the pieces you need to repair your ship. Both games give a definite sense of urgency to all players and both are really fun to play. The specialist cards in each give players a role that doesn’t seem forced and are useful for each game, which gives a sense of responsibility and uniqueness that is missing from a lot of cooperative board games. The saga continues! From ocean to desert, and now to the sky, this latest installment takes you to new heights. • Race against the clock! I think we all fantasize about traveling back in time at one point or another. Whether it’s being able to pick the winning lottery numbers or telling yourself not to eat gas station sushi (I honestly don’t know what I was thinking). In T.I.M.E Stories, you and your group can actually travel back in time (for a while anyway). T.I.M.E. Stories is a cooperative game in which each player takes on the role of a temporal agent in the T.I.M.E. Agency. Your goal is to prevent time paradoxes and protect the continuation of proper time flow… so no more going back in time and accidentally becoming your own grandfather and other such nonsense. All players go on a run through time and attempt to solve a mystery or case. On your first run, you’ll probably do very poorly and won’t be able to complete the scenario. It is, after all, rather difficult to simply walk in and solve everything from the past in a single day. Luckily, you have a time machine and you can always try again, which brings the main mechanic of the game to life. The scenario doesn’t change. Each run through the game will allow you to replay and correct past mistakes. Items that were extremely useful are in the same location and events that were detrimental can be avoided altogether. This simulates the time travel mechanic and allows you to continually improve and work closer to the scenario completion with every run. It’s a completely unique concept for a board game and is one of the more innovative themes in a board game I’ve seen in a while. The game itself is very fun to play and had a lot of excellent moments within the scenario. This brings with it a unique time travel paradox. The mechanic forces you to go back and replay the same scenario over and over until you are able to solve it perfectly. The whole point of time travel is to solve the case perfectly and you get to keep going back until you get it right. In a board game situation this is less desirable, and after about 5 hours you’ve completed the scenario… several times. 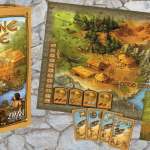 The base game only comes with one scenario and there are several expansions out, but the expansions are written by different authors, so each one is going to have a completely different feel. This basically destroys the replayability of the game. Unless you have short-term amnesia you’re going to know the ins and out of the scenario incredibly well, and if you’re playing with new players it’ll be new to them, but you’ll still know where everything is. That’s rather expensive for a game that can be rendered unplayable in a single day. 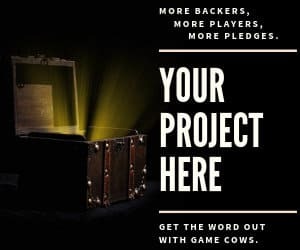 If you have a group of friends that all throw in $10 it’s not so bad and there are multiple expansions already out, and each one has a complete scenario to play through. T.I.M.E. Stories is no doubt one of the most innovative new board games out on the market today. It’s beautifully done and very fun and interesting… but only for a little while. If you don’t mind the price tag and want to play something unique then definitely pick it up, but if you’re a gamer on a budget you may want to try one of the other games on our list. In conclusion, Webster’s dictionary defines cooperative as… just kidding. I’m the worst. And apparently pretty slap-happy tonight. Board games, in general, are a fantastic way to bring people together. There’s a social aspect to board games that I don’t think can be replicated, but as anyone who’s ever played a “friendly” game of Monopoly will tell you, that’s not always the case. Cooperative board games don’t necessarily force you to work together. They put you in a situation where you have to depend on the other players. In many of these games you can definitely try to go it alone and do your own thing, but most reward you for being a team player, and talking to each other to come up with a strategy that everyone is happy with. I’ve played a lot of cooperative games with family members and friends, and it’s great to get to learn more about them as we play; what goals they favor, what methods they use to solve problems, how they deal with criticism, or how they deal with failure. That’s why I love the collaborative feature of cooperative games. I’m a huge fan of the shared experiences and storytelling that board games offer us, and cooperative board games intertwine the stories just a little bit more. What are your favorite cooperative board games? Which ones did we miss? Drop a comment below and let us know!